Water is our most precious natural resource and something that most of us take for granted! Everyone is becoming increasingly aware of the importance of water to our survival and its limited supply, especially in dry areas. 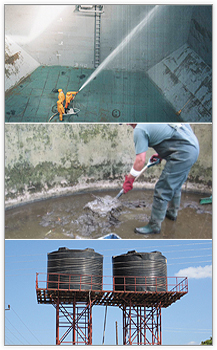 We have 10 years of experience in providing excellent Cleaning services for underground and overhead Water Tanks. Our customers can also avail from us a range of accurately processed, pure and highly efficient Water Treatment Chemicals. These professionals are properly briefed about a project and the precautions that are to be taken while doing the work. Further, we also conduct regular training sessions for our professionals so as to improve their efficiency in the respective domain. Penguin Water Care can provide the service for renewable supply of natural, soft, clear and odourless water that can be used for a range of purposes. Did you know your tank could harbor harmful bacteria, decaying vegetation, sediment, insects, reptiles or even animals! All which could be contributing to making you and your family sick! For peace of mind, don't wait - get your tank cleaned today ! To maintain a safe & healthy water tank - regular yearly inspections should be conducted By Penguin Water Care and your water tank should be cleaned at a minimum every year. To ascertain timely and cost effective services, we make use of technologically advanced machinery. The Penguin Water Care Company can do all this for you and talk to us about our ongoing maintenance program for inspections and of course our specialty - cleaning tanks!